ENTSO-E data to end of 2012 - do you see what Lovins does not? Lovins' footnote to the post begins: "The author gratefully acknowledges helpful data and comments by Craig Morris in Freiburg, whose blog is an exceptionally valuable source on Germany’s energy shift..."
Morris posted today, noting some issues with Lovins' facts, in "Do The Math"
Morris' post also notes a post from 'carbon counter' Robert Wilson - probably the real inspiration for Morris to provide more plausible figures than Lovins had. Those strike me as firm limits beyond which prices will again escalate. At levels far below that, the presence of renewable discourages investment in the baseload technologies characterized by high up-front capital costs and low operating costs - meaning renewables are likely to be accompanied by higher emissions generators in a system. 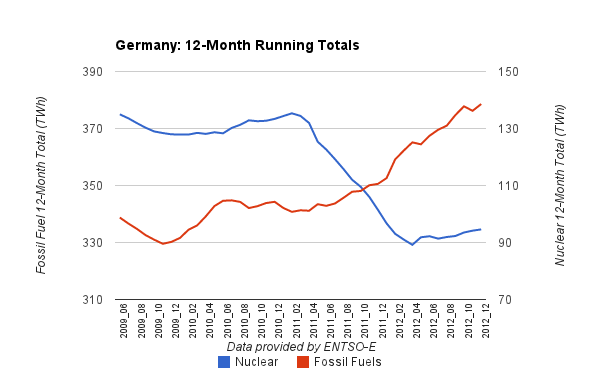 The National Inventory Reports for 2011 (filed in 2013) are now available for Germany, and Canada; Canada's including a break-down by province allowing a comparison of Germany and nuclear-heavy Ontario. The CO2 equivalent emissions from "electricity and heat" in Germany are 21 times higher than the same category in Ontario (Germany being 5.4 -6 times greater in GDP and population). Including the residential category drops the difference to 11.4 times. Whatever Lovins motivation is, it certainly doesn't appear to be emissions.